Many people, yours included here are tempted to just put their feet in any pair of shoes they find nice or fashionable and be done with it. However, do you know that the regular pretty and nice-looking footwear are often not the best choice for proper foot function or your overall health. Many people do not realize it but happy and healthy feet are the very foundation of overall well being. The consequences of wearing poorly fitting shoes can be a painful and debilitating lesson, which can lead to a variety of foot disorders like blisters, callouses, bunions, hammer toes, circulation problems. It can even change your skeletal system and the muscular structure that it supports and change your posture and the way you walk. If you wear an uncomfortable pair of shoes, your feet will ache and this can really make you tired and cause pain in the ankles, hips, knees and lower back. I was recently introduced to “MEDIFEET” footwear and I am in love... The shoes are highly comfortable, and you can wear it straight without the need for “breaking-in” (you know.. bending, twisting, biting, stretching your new pair of shoes so they do not hurt your feet) and yet durable thanks to the use of materials of the highest quality and their uncompromising and strict quality control. I was pretty surprised to find that each individual pair of shoes has over 10 performance features and the key material uses in the shoe is “PORON” which is wide accepted and wearable for easing leg problems. 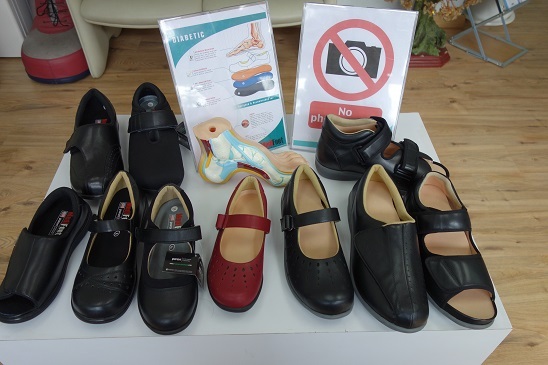 Not only are the shoes quite stylish and come in a variety of attractive colours, and heavenly on your feet but they are specially designed to help alleviate and/or avoid many of the foot problems. 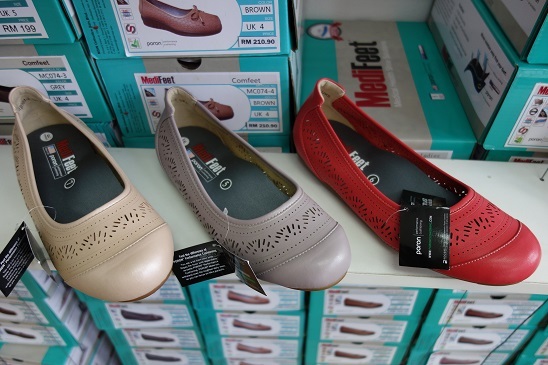 MediFeet shoes specialise in Health and Wellness footwear especially for diabetic, arthritic and other types of medical conditions patience that require special care. It is very important to wear good shoes, as our foot alone has more than 25 percent of the body's collected bone mass. Many people are not aware of this importance and well, if any of these bones become misaligned, our body may be affected in numerous ways. interfering with nerve signals from the feet to the brain. the worst cases, foot or lower leg amputation may be required. be considered when choosing footwear. loss of feeling or poor circulation often wear incorrect footwear. more likely to be wearing poorly fitting shoes. in preventing skin breakdown and foot problems. 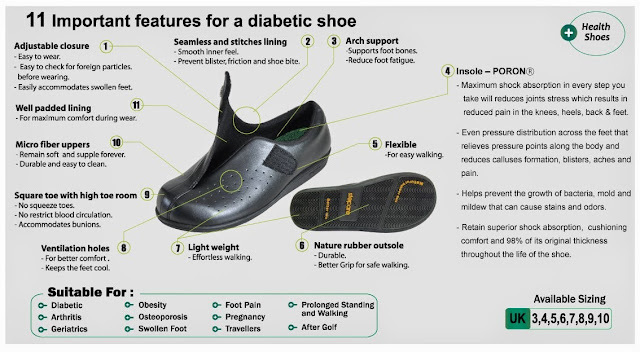 The MediFeet Diabetic shoe also has a specially formulated pure, chemically inert foam without blowing agent residues and with uniform cell structure with out regular cell walls. People who like elegance but a good quality footwear for their comfort. People who require special care for their feet, this will include patients with diabetes, arthritis and any other medical conditions. People who are concern for their own health. People who want to maximize the comfortable of their footwear. i like the value added to the shoe. i have searched a lot on net for medi feet shoes for back paining. please suggest me a good foot wear for back paining. and where i will get it. Our feet are the most imperative piece of our body since we can't move without them. In any case, they are the most disregarded a portion of our body. We should deal with our feet empowering us to walk magnificently around. In the old days in India individuals never wore footwear! The feet is one of the most used up part in our body, imagine it carries the weight of your body all day long. Which is why it is just rightly so that you give your feet some love by pampering them through various treatments. When you pamper your feet, why not look for something that can pamper your body as well like foot detox methods. The feet is amongst the almost all utilized aspect in this human body, visualize the item provides this excess weight of this human body everyday. This is why it truly is simply just appropriately in order that you allow your toes many appreciate by means of indulging these individuals as a result of a variety of cures. Corns are a common everyday foot problem that come about because of friction, irritation or pressure on the bottom of the foot. Corns will show up between the toes as well as on the toes. When the toes do not sit properly/comfortably together or when they are jammed into shoes that don't fit correctly corns will begin to form. I find a website for the Best Shoes for Sweaty Feet. If you want you can visit this site. My father is a diabetic patient and he feels pain in his feet while walking and visits Physiotherapy North Ryde regularly. I also want him to buy prono shoes as these look great for such patients so please guide me that how can I order such shoes and the payment method as well. One of the best things that MediFeet provide is that they offer comfort shoes for people with bunions. These shoes provide some essential features like wide toe box, cushioning and arch support. so this is the best shoes in my opinion.